Here's a song we sing at school. I wrote it on sentence strips. Each child gets a turn. They come up and find their name and put it in the line. Then we sing the song to them. They can dance, jump, etc while we sing their name. This is a great song for name recognition. 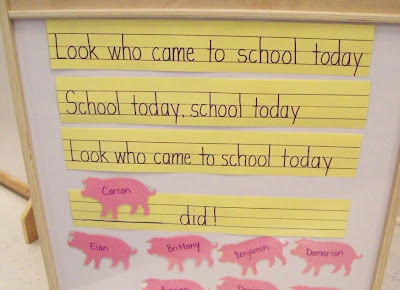 I chose pigs for the names because we are learning about The Three Little Pigs. It isn't necessary to choose a new die cut for each week; this is just something I did for now. You could change this according to season or you could use the same one for the entire year. Really great idea! I will add it to the songs I do during circle time. Here is a link to mine for you to see.